My friends and I exchanged glances. What could our 18-year-old tour guide possibly mean by ‘used to‘? Maybe she didn’t understand the meaning of stolen. After all, English was her third language – after Hmong and Vietnamese. 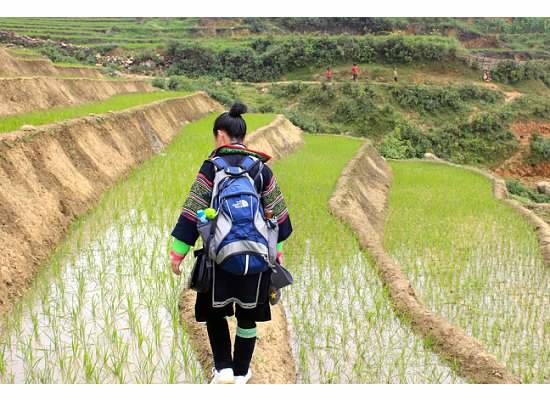 Zao had learned English from the tourists, who hiked through Sa Pa, snapping photos of the terraced rice paddies in the Hoàng Liên Son Mountains, buying trinkets and dyed cloth from the minority tribes that inhabited the mountains. We didn’t know what to say; Zao seemed unemotional about the story, and laughed at us as we scrambled for a response. This was a fact of life for her, and she wasn’t rattled by it. We tried asking for more information, but Zao made it clear that the subject bored her. This was just a glimpse of our time with Zao, where she would tell us shocking things in a really calm, almost blasé fashion. In addition to this story about human trafficking, she told us how suicide among teenagers had been customary when arranged marriages were the norm, how she had never been to a dentist or a doctor, and how her friend routinely left her infant child at home for 5-8 hours while she worked to support her family. Whenever we expressed astonishment at the stories she told us, she would laugh, as if it was no big deal, then ask us if we knew the Chinese love ballads she liked to watch on YouTube. I’ve thought about Zao and her family a lot since I came back from Vietnam. Her tenacity impressed me so much; at 18, she has her own apartment in town, has been working for 3 years, and speaks 3 languages. Her and her community’s experiences are highly attributable to the developing tourism industry in northern Vietnam. 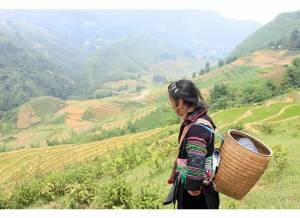 Most of her family is engaged in some facet of tourism – her mother has a stall in an artist market, her brother owns one of the two restaurants on the hiking trail, her sister runs a guesthouse for hikers, and her father operates a small fleet of motorcycles to transport hikers to the main town. Her family and community have made incredible economic gains by positioning their culture and landscape as a valuable tourist attraction. Despite this, there are a still a number of gaps that exist in the community, and country at large, most notably in infrastructure and public health. Learning about Zao’s life as a member of a small minority enclave in a developing nation illuminated some of the scarier aspects of life without a strong support network. Mental healthcare, primary healthcare, and childcare services appear to be quite limited, as does law enforcement. Zao’s friends and family are forced to contend with issues that many of us do not think about, due to our country’s social infrastructure. Stories like Zao’s are an important reminder of the disparities across the globe, and reinforce the need to continually advocate for our universal human rights.